MEXICO CITY, Mexico (CNN) -- The Mexican and Chinese governments sent chartered flights to each other's countries on Tuesday to pick up their respective nationals stranded or quarantined because of the global swine flu outbreak. 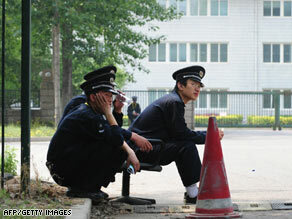 Security guards outside a sealed-off hotel in Beijing on Monday, where Mexican nationals were quarantined. By Tuesday, the number of confirmed cases stood at 1,085 in 21 countries, according to the World Health Organization. Twenty-five people have died of the virus in Mexico; one died in the United States. An Aeromexico flight was making several stops throughout China to collect nearly 70 citizens who were being held in quarantine across the communist nation as part of its strict swine flu-control measures. The flight will make stops in Beijing, Shanghai and the southern city of Guangzhou. China suspended all flights into and out of Mexico -- the epicenter of the flu outbreak -- after a 25-year-old Mexican man who arrived in Shanghai from Mexico City on Thursday became the country's first confirmed case of the virus, scientifically known as Influenza A (H1N1). Sixty-eight passengers and crew members on the flight with the infected man were quarantined in various parts of China. As a result of the flight suspensions, 200 Chinese citizens were stranded in Mexico City and Tijuana. A China Southern Airlines flight was expected to fetch them Tuesday, state media said. Mexican officials have bitterly criticized China for putting Mexican citizens in isolation. They said Mexicans were being singled out because of their passports, despite showing no signs of the virus. China has denied discriminating against Mexicans, saying it is exercising proper precaution to prevent the spread of the virus. Mexico City officials -- citing improvement in the battle against the virus -- announced plans to reopen government offices and restaurants Wednesday, and museums, libraries and churches the following day. Federal officials lowered the nation's health alert level Monday from red, or "high," to orange, or "elevated," and said university and secondary students can return to class Thursday while younger students will wait until May 11. "The measures we have taken, and above all the public's reaction, have led to an improvement," Mexico City Mayor Marcelo Ebrard said at a news conference. "But I insist that the virus is still present, that we need to remain on alert and the resumption of activities will be little by little, not all at once." Other public venues in the city such as bars, nightclubs, theaters and sports stadiums will remain closed indefinitely. All schools in the nation also will remain closed until further notice. There have been 590 confirmed cases, including 25 deaths in Mexico -- the epicenter of the outbreak, according to the World Health Organization. Mexican Health Minister Jose Angel Cordova Villalobos said another death and an additional 701 cases have been confirmed at the local level. Last week, Mexico City closed all public venues and limited restaurants to take-out orders only, affecting 35,000 businesses.